Senator Henry Clay introduced a series of resolutions on January 29, 1850, in an attempt to seek a compromise and avert a crisis between North and South. As part of the Compromise of 1850, the Fugitive Slave Act was amended and the slave trade in Washington, D.C., was abolished. 3. 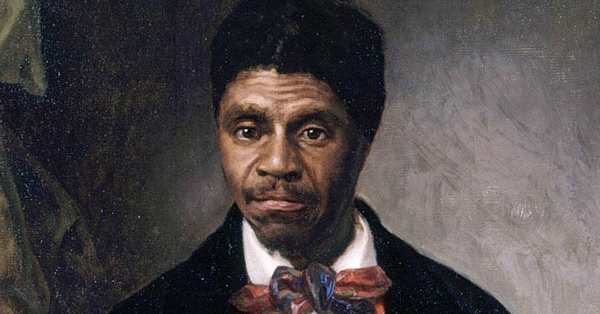 )Congress would abolish the sale of slaves, but not slavery, in D.C. 5. )A Fugitive Slave Act would order all citizens of the United States to assist in the return of enslaved people who had escaped from their owners. It would also deny a jury trial to escaped slaves. Historians have evaded the issue, focusing on the political events behind the Civil War rather than on "Uncle Tom's Cabin." and a question. How did abe lincoln win his election? Many people of that era attributed it to "Uncle Tom's Cabin," because Stowe's novel changed the political scene by making the North, formerly hostile to antislavery reform, far more open to it than it had been. The novel paved the way to an antislavery candidate like Lincoln. Simultaneously, it stiffened the South's resolve to defend slavery and demonize the North. 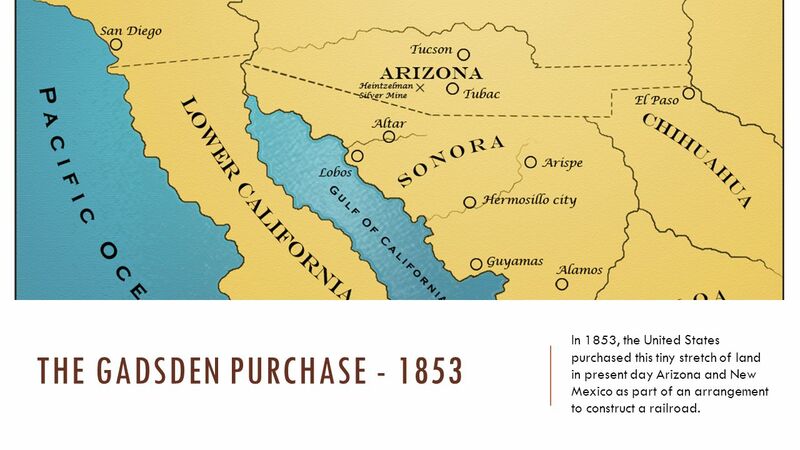 The Gadsden Purchase, or Treaty, was an agreement between the United States and Mexico, finalized in 1854, in which the United States agreed to pay Mexico $10 million for a 29,670 square mile portion of Mexico that later became part of Arizona and New Mexico. Gadsden’s Purchase provided the land necessary for a southern transcontinental railroad and attempted to resolve conflicts that lingered after the Mexican-American War. In 1853, Mexican officials evicted Americans from their property in the disputed Mesilla Valley. When the U.S. Government did not act, Governor William Lane of New Mexico declared the Mesilla Valley part of the U.S. territory of New Mexico. Mexican President Antonio de Santa Anna responded by sending troops into the valley. Attempting to defuse the situation, U.S. President Franklin Pierce sent James Gadsden, the new U.S. Minister to Mexico, to negotiate with Santa Anna. Secretary of State William Marcy instructed Gadsden to renegotiate a border that provided a route for a southern railroad, arrange for a release of U.S. financial obligations for Native American attacks, and settle the monetary claims between the countries related to the Garay project. By February 1854, anti-slavery Whigs had begun meeting in the upper midwestern states to discuss the formation of a new party. One such meeting, in Wisconsin on March 20, 1854, is generally remembered as the founding meeting of the Republican Party. The Democrats and Whigs were sharply divided over the slavery issue, and their power struggles cleared the way for the rise of a new political party, the Republican Party, which was formed in 1854 and stood united in their determination to prevent the spread of slavery into the territories and preserve the Union. The Kansas-Nebrask Act was an 1854 bill that mandated “popular sovereignty”–allowing settlers of a territory to decide whether slavery would be allowed within a new state’s borders. Proposed by Stephen A. Douglas–Abraham Lincoln’s opponent in the influential Lincoln-Douglas debates–the bill overturned the Missouri Compromise’s use of latitude as the boundary between slave and free territory. 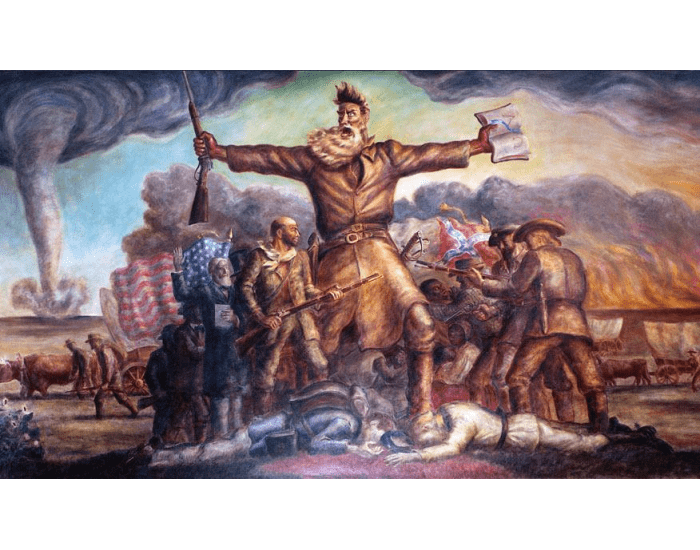 The conflicts that arose between pro-slavery and anti-slavery settlers in the aftermath of the act’s passage led to the period of violence known as Bleeding Kansas, and helped paved the way for the American Civil War (1861-65). The Ostend Manifesto, a.k.a. Ostend Circular, was a document written in 1854 that described the rationale for the United States to purchase Cuba from Spain while implying that the U.S. should declare war if Spain refused. The Ostend Manifesto was a document written on October 9, 1854 in Ostend, Belgium. The document was written by U.S. diplomats, James Buchanan, the U.S. minister to Britain, John Young Mason, U.S. minister to France, and Pierre Soulé, U.S. minister to Spain. An attempt to expand U.S. territory, the Ostend Manifesto pushed for Spain to sell Cuba to the United States for $120 million dollars. The document also suggested that if Spain were to refuse, the U.S. would use force as an effort to get them to agree. Intended to be a secret, the document leaked and was eventually made public. Although it was primarily an attempt to expand U.S. territory, the document also caused uproar against antislavery groups because Cuba was already an established slavery territory. 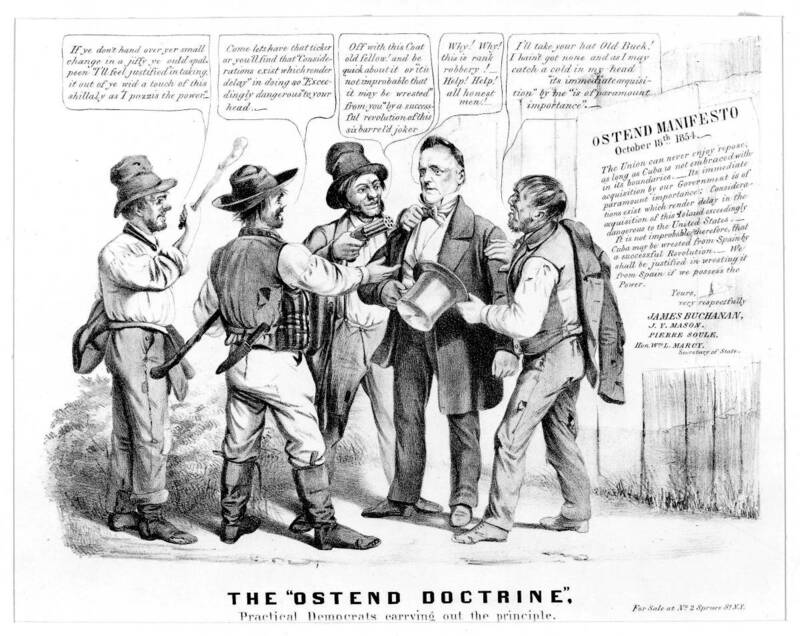 The Ostend Manifesto was declared unconstitutional due to the Fugitive Slave Law that was passed as part of the Compromise of 1850; therefore Cuba did not become a U.S. territory. 22 May 1856 may have been the worst day in the history of the United States Senate. 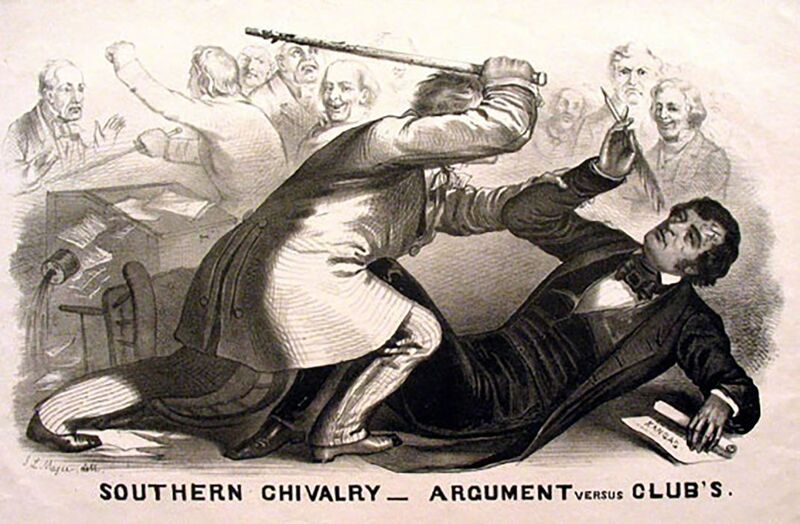 Late that afternoon, after both houses had recessed for the day, a young South Carolina congressman named Preston Brooks strode forcefully into the Senate chamber looking for Massachusetts Senator Charles Sumner. The Senate floor was nearly deserted, but Brooks saw Sumner sitting alone at his desk, preparing a stack of pamphlets for mailing. Without warning, Brooks rushed forward and began beating the unsuspecting Sumner savagely with a gold-tipped wooden cane. Even after knocking the older man to the ground, Brooks continued raining down blows upon Sumner's bleeding head and defenseless body, only stopping when his cane shattered into pieces. Finally, after perhaps the most shocking few minutes in the history of Congress, Brooks turned and walked calmly out of the chamber, leaving Sumner bloodied and unconscious. Signed as presented by Samuel A. Winsor. Published by the Burkick Brothers, New York. Bookplate removed. In 1857, Hinton Rowan Helper, the son of a western North Carolina farmer, published one of the most politically influential books ever written by an American. 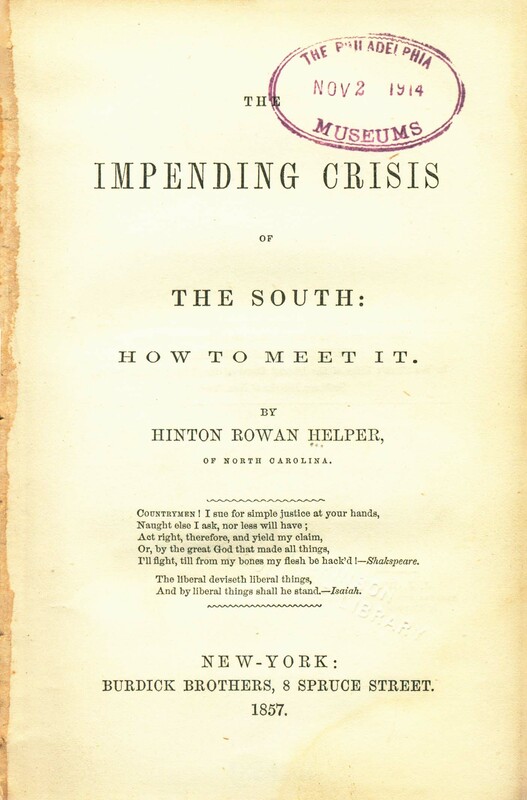 ’The Impending Crisis of the South’ argued that slavery was incompatible with economic progress. Using statistics drawn from the 1850 census, Helper maintained that by every measure the North was growing far faster than the South and that slavery was the cause of the South’s economic backwardness. Helper’s thesis was that slavery was inefficient and wasteful, that it impoverished the South, degraded labor, inhibited urbanization, thwarted industrialization, and stifled progress. A rabid racist, Helper accompanied his call for abolition with a demand for colonization. He concluded with a call for non-slaveholders to overthrow the South’s planter elite. During the 1860 presidential campaign, the New York Tribune distributed 500 copies of the book a day, considering it the most effective propaganda against slavery ever written. Many Southerners burned it, fearful that it would divide the white population. The Panic of 1857 was a financial panic in the United States caused by the declining international economy and over-expansion of the domestic economy. 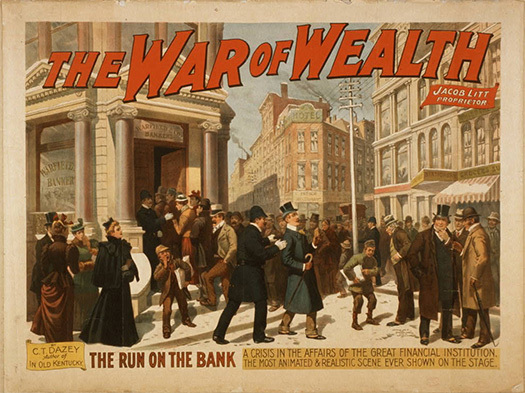 Because of the interconnectedness of the world economy by the 1850s, the financial crisis that began in late 1857 was the first worldwide economic crisis. On the night of October 16, 1859, Brown and his band overran the arsenal. Some of his men rounded up a handful of hostages, including a few slaves. Word of the raid spread, and by morning Brown and his men were surrounded. A company of U.S. marines arrived on October 17, led by Colonel Robert E. Lee and Lieutenant J. E. B. Stuart. On the morning of October 19, the soldiers overran Brown and his followers. Ten of his men were killed, including two of his sons. The wounded Brown was tried by the state of Virginia for treason and murder, and he was found guilty on November 2.The 59-year-old abolitionistwent to the gallows on December 2, 1859. Before his execution, he handed his guard a slip of paper that read, “I, John Brown, am now quite certain that the crimes of this guilty land will never be purged away but with blood.” It was a prophetic statement. Although the raid failed, it inflamed sectional tensions and raised the stakes for the 1860 presidential election. Brown’s raid helped make any further accommodation between North and South nearly impossible and thus became an important impetus of the Civil War.